Celebrate Easter with a Baptism! Parents, now would be a good time to discuss with your child what it means to place our faith in Jesus and take the step of baptism. If you’re an adult who needs to take this step, we have a video for you to watch. The video featured on this page interviews people in our church who made the decision to be baptized as adults. 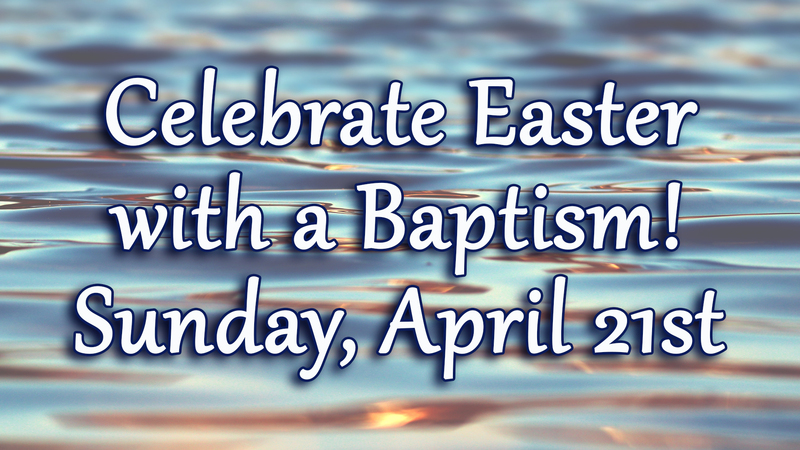 To join the Easter Baptism Celebration, or if you have questions, contact Pastor Tom or call 512-345-3771. Why Should I Be Baptized? Baptism is a symbol of salvation, just like a wedding ring is a symbol of marriage. A ring cannot make a person married, but it is a constant reminder of the commitment a couple makes. Likewise, baptism doesn’t grant you salvation, but it is a powerful picture of our union to Jesus, who died for our sins and rose again. How Should I Be Baptized? The pastor will immerse you into water and will bring you back up again. This is a powerful picture of our union with the Lord who died for us and our commitment to die to sin (Romans 6:3-4). When Should I Be Baptized? Jesus commanded His church to baptize people after they become disciples (Matthew 28:19). Your baptism should be arranged soon after you've made this decision. Contact Lisa, Pastor Tom's assistant, if you have any questions or if you want to schedule your baptism (512-345-3771 or ).